Soak dry chillies for 10 minutes in water.Grind all the ingredients except oil into a fine paste.Heat oil and add the paste and saute once and keep aside to cool.Store in a air tight container in the refrigerator. Use as and when required. 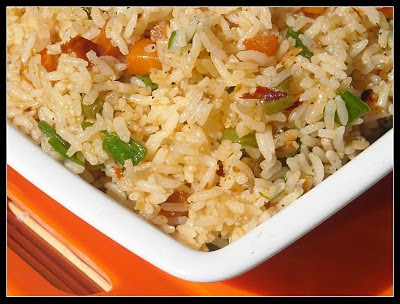 Cook rice with 1tbsp of oil. Heat oil in a pan add ginger and garlic pieces. Add vegetables and stir fry for 2-3 min on high until veggies are cooked. Now add schewan sauce,soya sauce and ajinimoto.Cook for 2 min, add salt. Then add rice and mix thoroughly,sprinkle pepper powder. Fried rice looks absolutely inviting and yummy..
Lovely looking fried rice, looks so yummy. wowwwww....im a big fan of fried rice, bt never tried this....ajinomotto is nt good for health..you can say it as optional.. 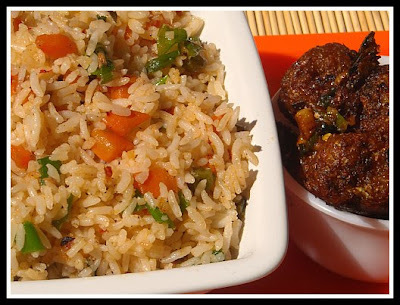 I love schezwan rice, lovely click. The rice looks so lovely! I like it! I can't wait to make some. Sounds like a interesting recipe. Love the pic.